LYTHAM PARISH Is bounded on the south and south-west by the Ribble, on the north by the, parish, of Bispham, and on the east by the parish of Kirkham. It is about seven -miles in length from east to west, and two miles in breadth from north to south, and its area in statute acres is 5289. In 1841 it contained 2082 inhabitants, and its annual value in the same year amounted to £8900. About two-thirds of the cultivated land of the parish is arable, and the average rent is from 20 to 30 shillings per statute acre. The soil is generally good and in a high state of cultivation. Lytham Moss is a small tract of peat land, in this parish, beneath which great numbers of oak and elder trees have been found. The entire parish belongs to Thomas Clifton, Esq. of Lytham Hall, who carries an extensive tile manufactory here, under the management of Mr. Alexander Faulkner; but the parish is almost wholly destitute of minerals and a large tract of sandy common (pictured) extends for a considerable distance along the banks of the Irish Channel. The rateable value of the parish is £11,909. 1s. 2d., and the number of rateable acres is 5084 acres, 2 roods, 9 perches. LYTHAM Is a rapidly improving maritime town and fashionable watering place, delightfully situated on the northern shore of the estuary of the Ribble, and in a highly cultivated district of the Fylde, six miles S.W. 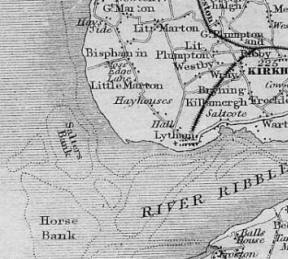 of Kirkham, eight miles south of Blackpool, by the road, and 10 miles S.W. by the Sands, eight miles N. of Southport by sea, and 12 miles W: of Preston by road, and 14 by rails. 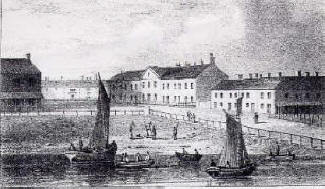 This pleasant and justly popular sea-bathing place is one of the most attractive in the county of Lancaster; its climate is mild and equable, its sands are smooth and elastic, whilst its wide-spread beach has not perhaps a rival for panoramic beauties amongst the watering places of England. Of late years, several causes have contributed to enlarge ­and improve this beautiful and interesting town; amongst which may be mentioned the railway communication effected to it from all parts of the kingdom, by the opening to Lytham of a branch of the Preston and Wyre railway in 1846; the placing of the tenure of the land a few years ago upon a more liberal basis, the consequence of which has been a rapid extension of buildings, handsome villas, and mansions of the wealthy. 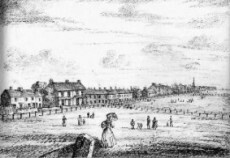 But perhaps the most important cause of all is the great advantage which the place has derived from the operation of an act of parliament, called the Lytham Improvement Act, passed in 1847, vesting the management of its local affairs in a board of commissioners, the fruits of whose labours my be seen in the erection of gas works, a handsome and commodious market-house, the carrying out of a general system of sewerage, and other sanitary regulations, thus conferring on the inhabitants and visitors of Lytham most of the con­veniences and advantages possessed by the largest towns in the kingdom. 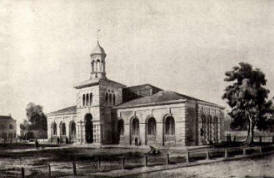 The market house, erected at a cost of £1400, is a handsome brick and stone building, planted round with elm trees, and was opened 19th June, 1848. The markets, which are held on Wednesday and Saturday, are well supplied with provisions, &c. In 1850, two annual cattle fairs were established here on the second Tuesday in April and second Tuesday in October. The gas works were erected in 1850, at a cost of about £2500, raised by loans, with security on the rates, and the town was first illuminated with burning vapour in the September of that year. The gasometer is 35 feet in diameter by 13 feet deep, and will contain 12,500 cubic feet of gas. The railway station is a commodious and ornamental stone structure in the Doric style, at the east end of the town, and is entered by a handsome archway, which leads into a circular vestibule, sixteen feet in diameter, surrounded by pilasters, and a regular entablature, covered with a deeply panelled dome. 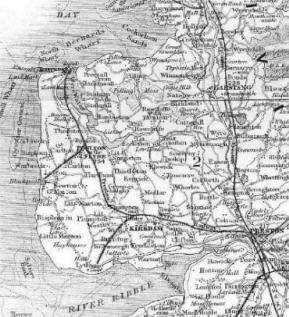 The Lytham branch line from the Preston and Wyre railway is 4 miles 6 furlongs in length, and joins the main line about a mile north of Kirkham, in the township of Westby. The quantity of excavation is 100,000 cubic yards, the highest embankment 11 feet, and the deepest cutting 27 feet. There are three timber bridges, one of stone and another constructed of bricks. 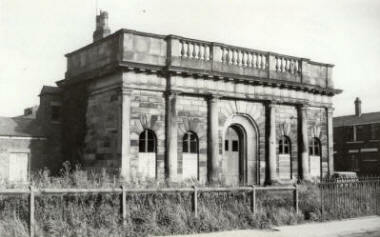 The line was opened to Lytham 16th February, 1846, and the capital required or its construction was £50,000. Nearly all the houses in Lytham are built in one uniform style, and the place is greatly enlivened by the number of lime trees that have been planted here within the last few years. In the town are three spacious and excellent hotels, viz., the Clifton Arms, the Railway and the Market hotels, besides a good inn called The Ship. The Clifton Arms hotel, which was erected in 1840, is a splendid building, on the west beach, commanding a fine view of the ample estuary of the Ribble, at the point of its discharge into the Irish Sea, and of the opposite coast, with its churches, mansions, and hills. It is elegantly furnished and has accommodations for family carriages, and stabling for several horses. It is also supplied with hot and cold baths, billiard rooms, &c. The other hotels are also of the first order, and possess accommodations for families of the highest respectability. These have been erected within the last three years, as have likewise several private lodging houses, all of which are comfortably fitted up for the reception of visitors. There are in the town many good shops, the windows of which display much taste in the arrangement of their various commodities. 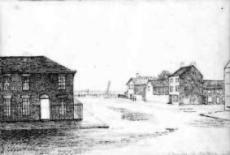 The first inn erected at Lytham for the use of the temporary inhabitants was the Wheat Sheaf, which was built in 1794, but this, together with an extensive range of old buildings, have been pulled down, and several new houses (Dicconson Terrace) and a billiard room erected on their site. The beach has also been levelled, and an esplanade or public walk formed. On the east beach an extensive public baths, kept by Mrs. Middlehurst, and at the Clifton's Arms hotel and Ship Inn are bowling greens. The parish church, dedicated to St.Cuthbert, is a handsome brick edifice, consisting of nave, chancel, side aisles, and porch, with a tower at the west end. It was rebuilt in 1834, and supplanted another which was erected in 1770, on the site of the original fabric, which existed as early as the 12th century. This is evident from the terms of the grant made in the reign of King Richard, by Richard Fitz Roger, who gave to God and the monks of Durham all his land of Lytham, with the church of that town, that they might found a Benedictine cell there, to the honour of Street Mary and St.Cuthbert, which was accordingly done. 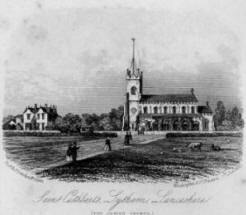 The foundation stone of the present church was laid on the 20th of March, 1834, by Thomas Clifton, Esq., who contributed £500. towards its erection. Mrs. Fisher contri­buted £300., and the subscription was aided by a grant from the society for building churches and chapels. It is lighted by spacious windows, all of beautifully stained glass. Here are several marble monuments, perpetuating the memory of some members of the Clifton family, with the usual Catholic conclusion-RIP. or, requiescat in peace, to their inscriptions. The living is a perpetual curacy, in the gift of Thomas Clifton, Esq., and incumbency of the Rev. Richard Barton Robinson, who resides in the Parsonage house, a very commodious and pleasant residence near the church. The curacy has been endowed with about £ 1000. in land and money, of which the sum of £800. was received from Queen Anne's bounty, and it has been returned as of the annual value of £131.The tithes of the parish were commuted, in 1840, for £568. 4s. Id., of which £548. 4s. Id. are for the great, and £20. for the small tithes. The church stands about a quarter of a mile west of the town, and is nearly surrounded by a thriving plantation. On the east beach is another church, dedicated to St. John. This is also a handsome building, in the early English style of architecture. It was erected in 1848-9, at a cost of about £4000., from a design of Mr. Edwin Hugh Shellard, architect, of Manchester, and was consecrated on the 11th of September, 1850. It consists of nave, chancel, side aisles, porch, and tower, surmounted by a lofty spire; and it has been presented with a good organ, by W. R. Swainson, Esq., of Cooper Hill, near Preston. This living is also & perpetual curacy, in the patronage of the lord of the manor, and now under the ministry of the Rev. W. H. Self. The Catholic chapel, in Clifton street, is a large brick and stone edifice, in the Gothic style of architecture, and was erected by subscription, at a cost of about £2000., and opened for divine worship in 1839. 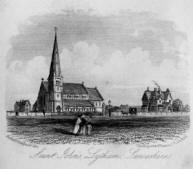 Though it will accommodate about 700 persons, it is much too small for the Catholics of Lytham and immediate neighbourhood. The Rev. Joseph Walmsley is the present pious, zealous, and talented pastor of this congregation. In Bath Street is a Wesleyan chapel, erected in 1846; it will seat about 200 hearers. The parish enjoys the advantage of an endowed free school, or rather schools, for, in addition to the boys and girls schools in the town, there is also one at Heyhouses for both sexes, established about 1789. The principal endowment for these schools arises out of the rental of land, of the value of about £130. a year, purchased with the accumulated bequests of the charitable during the last century, and vested in 17 trustees. According to the parliamentary commissioners' report, a school existed here previous to 1702; and in 1732 the school stock amounted to £198. 10s., with which, and other money, purchases were made in land for the benefit of the school. The original school is said to have been built by Richard Salthouse, and was used until 1793, when a new school-room was raised upon a site be­longing to Mr. Clifton. It was rebuilt in 1821, and stands between the parish church and the town. The present number of boys in attendance is 90, and of girls 85. Mr. Robert Symonds is master, and Mrs. Betty Green­wood is mistress of the schools at Lytham, and Thomas Kendal is master of that at Heyhouses. A lodge of the Independent order of Odd Fellows, of the Manchester Unity, is held at the Railway hotel. Of the early history of Lytham little is known, except that Richard Fitz Roger, as before stated, founded and endowed a cell here for a prior and Benedictine monks, dependent on the priory of Durham. This foundation was made in the latter part of the reign of Richard I. 1188, and King John granted a charter of confirmation about the year 1200. At the suppression of religious houses, its annual revenue, according to Tanner, was £53. 15s. 10d. In 32nd Henry .VIII. it was granted to Sir Thomas Holcroft, Knight., and his descendant, Sir John Holcroft, is said to have sold Lytham, in 1606, to Sir Cuthbert Clifton, of Westby whose descendant, Thomas Clifton, Esq., of Lytham, is the present lord of the manor and owner of the parish. The name may be a corruption of Lithe-ham, Lethe being a very ancient name for barn, and ham, a Saxon word, signifying a place of abode; or it may be derived from litus, the Latin for shore, and ham: it is' called Lidun in the Domesday survey. Dr. Leigh says that there was a village of Saxon fishermen here, and that Cross slack was originally termed “Churchyard Slack," from there having been a religious oratory and cemetery there. This is supposed to have stood between the present church and the sand hills, in a direction towards the common side. 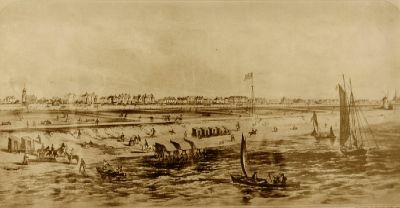 Lytham Pool, which is about a mile east of the town, is nearly formed into a natural dock; large enough to contain a fleet of men of war, and at its northern extremity is a small graving dock. 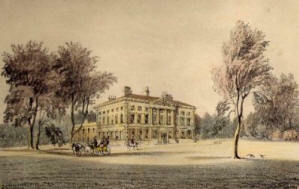 LYTHAM HALL, the seat of Thomas Clifton, Esq., is a superb and stately mansion, nearly embosomed in wood, about half a mile north-west of the town. It was erected by the late Thomas Clifton, Esq., between the years 1757 and 1764, partly on the site of the old hall; and has three fronts, the principal of which is to the east, and is ornamented with a noble pediment, supported by four beautiful Corinthian columns. The mansion contains many excellent and well-furnished apartments, and the gardens, greenhouses, shrubberies, and plantations are extensive and well disposed. Two neat lodge houses are now being erected at the entrance from Lytham. The stretching landscape into smoke decays"
The ancient Catholic chapel, which stood near the hall, has been demolished by the present proprietor, who is not of that religion. The Cliftons are a very ancient family, and are allied to some of the most honourable families in the kingdom. It is stated in the Baronetage, vol. ii. p. 272, that among the list of baronets, who are now extinct, since their creation, through default of male issue, or attainder, that Charles II created in order, No. 614, on the 4th day of March, 1660, Thomas Clifton, of Clifton, Bart. He was created baronet in consequence of the large sum of money paid into the treasury of the kingdom by his ancestors in the reign of James I., a sum which, it is said, would maintain 30 men, at eight-pence per day, for three years. We shall conclude our notice of Lytham with the following extracts from Mr. Whittle's “Marina," a work which contains a variety of useful and interesting information.
" 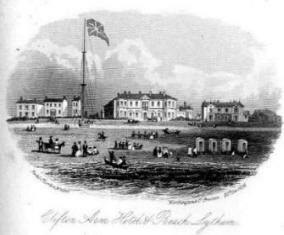 No watering place can excel Lytham in convenience of bathing, few can equal it - the shore being level and over­spread by a sheet of the finest sand, which being daily covered by a fine tide, affords an opportunity of indulging the salubrious bath with equal pleasure and safety. For the accommodation of the company, bathing machines are kept here, which during the height of the season meet with constant employment: these machines are driven into the sea to a suitable depth, attended by careful and experienced guides. The sea here is in general free from sea-weeds or dirt, which is so common at many other parts of the coast, and the water perfectly clear and pure. The general appearance of the coast here and opposite is remarkable for its flatness, save where the sand hills rear their bleak and sterile heads. 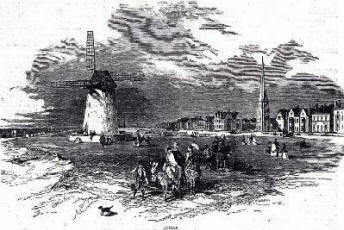 There are many things worthy the observation of the naturalist in the vicinity of Lytham; the fossilist, the botanist, and the zoologist, in their rambles on the sea shore, amongst the sand hills, or in the fields, may each, whether in the pursuit of health or pleasure, enjoy his favourite amusement. Innocent recreational delight,reading, walking, sailing, and other modes of pastime, banish care from the mind, whilst the salubrity of the air expels disease from the body."